Can you tell I'm working on a theme here? Not really intentionally, more out of a need to utilize the plethora of veggies being harvested from my garden right now. This recipe was a 'middle of night, can't sleep, thinking about what to do with all my veggies' idea! 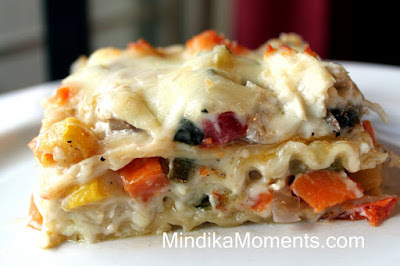 I had several different ideas, but they morphed into lasagna...chicken lasagna...with roasted veggies! So, you're probably going to look at this recipe and think it's too long, too involved and/or too hard. I'm not going to lie and tell you its one of those throw together super easy meals, but I assure you it isn't as time consuming or difficult as it may read. Minus the cooking time, all the prep took me less than an hour. I would call this a 'Sunday dinner' or 'special occasion' recipe. And I promise you, it's worth a little work. It was delicious!! 1. Dice all the veggies into ¼ inch cubes. 2. Spread onto a large baking sheet, sprayed with cooking spray. 3. Drizzle with olive oil and season with salt & pepper. 4. Roast in a 450 degree oven for 30 minute. Remove from the oven and allow to cool while you prepare the sauce for the Lasagna. 1. Put everything in a large stock pot. Chicken can be frozen. 2. Bring to a boil over high heat. Reduce heat to medium and allow to simmer for 20 minutes or until chicken is cooked through. 3. Remove from heat, drain and allow chicken to cool. When cool, shred with a fork. 1. In a larges sauté pan, melt the butter. Add the garlic and allow to cook over low heat until the garlic starts to brown slightly. 2. Add the flour to form a rough. 3. Add the cream and stock. Increase heat and bring to a boil. 4. As the sauce begins to thicken, add the cheese and chicken. 2. Bake in a 350 degree oven for 30-40 minutes or until hot and bubbly. *For you non-meat eaters out there...Lisa...wink, wink...just leave the chicken out of the sauce and this will still be super yummy! You can also use vegetable stock instead of chicken stock. It was yummy. I'd totally love it even more just as a veggie one... the veggies were so so good! You have such great recipes - I love browsing your blog for ideas. I think I'll make this one tonight. Thanks for sharing! Can I prepare this the day before and then bake the next day?